Great Tunics! have to give this pattern a try. Thank you, Lynne! 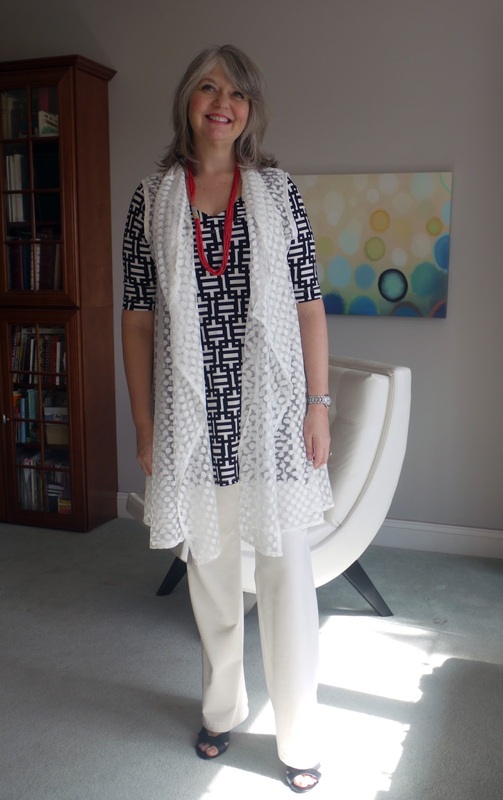 The vest is using Butterick 4989. It's now out of print, but a nice pattern if you can locate a copy! All of the outfits are very becoming! May have to give that pattern a second look. I instantly added this pattern to my list for next time they're on sale! You did a great job on these, I like your fabric choices very much. The lace chest is beautiful, but perhaps it competes (dilutes?) 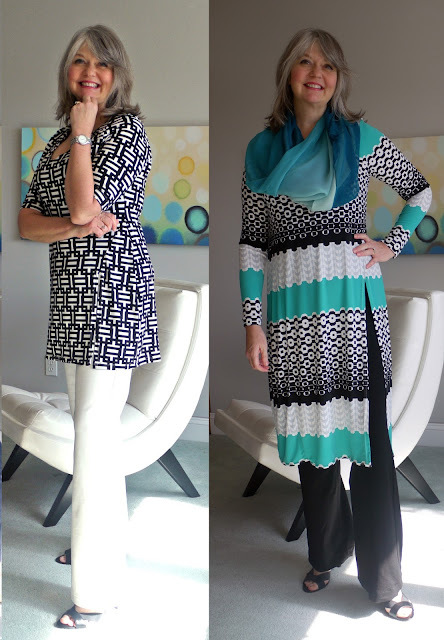 the prints tunics. Thank you, Kathie! That's my concern about the vest too. 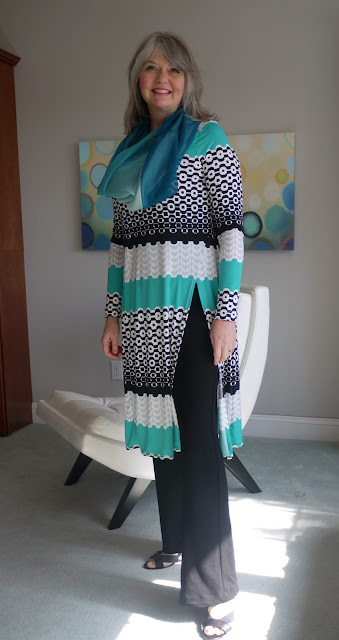 Love the tunics and pants, and scarves. The waterfall vest is cool, but to my eyes, worn over the printed tunics is a bit too much going on. I think it would be best over solid color matching pants and tunic. That way the waterfall vest will shine. Thanks, Patsijean. I will need to experiment with some solids. I love the tunics, but without the vest. They look great on you. I may have to give that pattern a try. Oh Ann!! I love all of these!! And the simple print and sheerness of the vest combined with the tunics creates a nice depth. 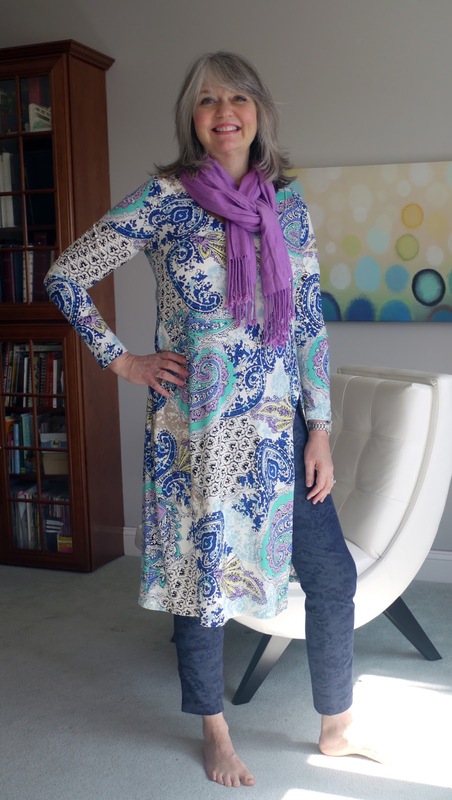 I love it over both tunics! Thanks, Nakisha. That's a great observation. It kind of makes you wonder more about the fabric underneath it. Definitely yay for the white lace over the tunics! Your tunic collection looks great! Ann, I love them all and the lace vest is adorable! Well done! The lace vest looks great over the black/white print. I agree with a previous poster, it adds depth but is not too busy. Thanks for the review, especially commenting on the neckline adjustments. 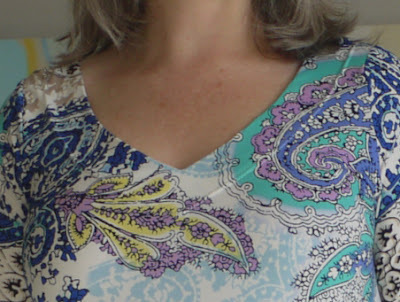 When I saw the pattern, I thought yikes, that is a deep and wide neckline, and then I saw your adjustments - perfect! I would look for this pattern now, all three pieces look like they have real TNT potential. Thank you! Yes, I really think it's a great pattern. I've already got a couple more pieces planned! Love your test garment best! I've been doing narrow pants with a long tunic a lot lately. Hadn't thought to combine it with a deep slit, though. Thanks for the idea! Thanks, MJ! I like it with the leggings as well. The flares are a little dressier, but with a legging it goes casual. I'm a big fan of mixing prints and textures, so I vote "Yay" for the vest with the tunics. The reason why I think it works is because the circular shapes in the vest fabric echo the circles in the print of the long tunic. 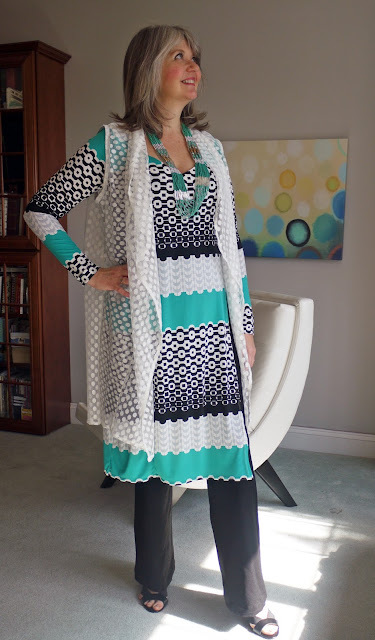 I would go with a solid teal necklace or scarf with the long tunic and vest. The circles in the vest contrast nicely with the graphics of the short tunic - round vs. angular. I love the red necklace with this outfit! 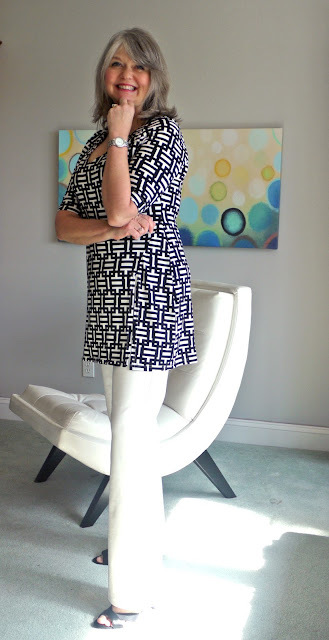 I think I'm going to have to dig out some of my ITY's and make some tunics for spring! I like your analysis! I think you are right- a solid scarf would be better- just need to find the right shade of teal.